The smell of funnel cakes, hot dogs, and burnt rubber fill the air as spectators from around the nation sit in the stands, listening for the rev of two engines ready for battle. Drunk with anticipation the excited crowd has already seen Ferraris and Corvettes among others race around the same track earlier in the day. Now they’re eagerly waiting to see a smoke trail of horsepower drift around each clip of West Virginia’s Summit Point Motor Park’s Raceway. It’s not Tokyo Drift. And it’s not called a race. 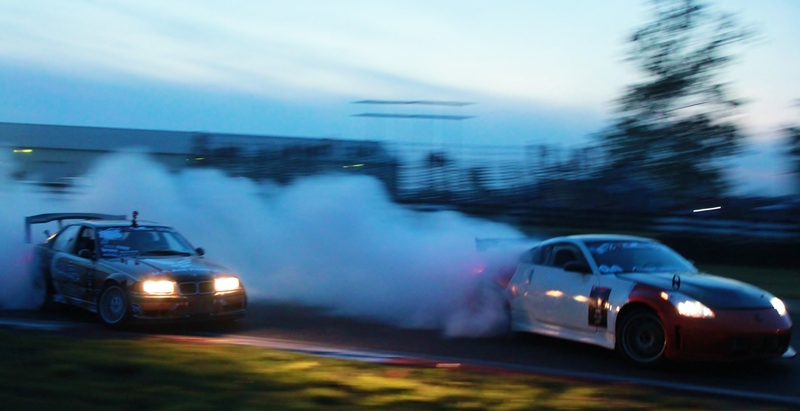 No, the professionals will tell you that this event is the fourth round of the 2012 Xtreme Drift Circuit series. It’s a serious competition and it’s not a lap–it’s called a run. Drivers are judged on their ability to over steer, lose traction of the rear wheels, and maintain control of the car as it hits the apex. Judges at this event include Mike Schneider for speed, Chris Forsberg for angle, and Brian Eggert for line. Impact, such as the crowd’s reaction to the performance, is also taken into consideration during the competition. 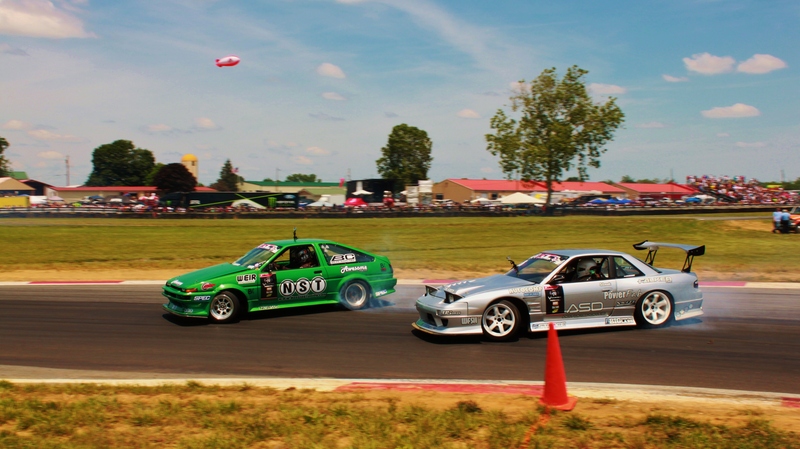 This event is part of Hyperfest, which is an annual motorsports extravaganza that includes everything from races and rollover derbies to classic and luxury car shows to daisy duke competitions. It’s one of the biggest events held in the region and for the sport as well. While the fans dabble in the fun across the track, up the hill NonStopTuning’s AE86 Toyota Corolla driver, Will Parsons, works on his green car to prepare for the Tandem rounds. He explains that the AE86 is credited as the rear-wheeled car that started it all and also talks about the godfather who took the Japanese sport international, drift king Keiichi Tsuchiya. When asked about the feedback from the fans that look at the appearance of his car that doesn’t scream sports or luxury but demands respect for its history and performance—he smiled. Some he says don’t really know what to think or understand of the Hachi Roku. Others though, like the man in his 20’s seen earlier in the day stopping dead in his tracks to enthusiastically take a photo of the 86, do. Those are the ones that make him proud. Parsons 86 has finished in the top four of the last four rounds of XDC, the only driver to do that of any of the teams, NonStopTuning team president, Mike Rahimi said. Inside the truck parked across from Parsons sits his NST teammate, Chelsea DeNofa, who won round three in Orlando. 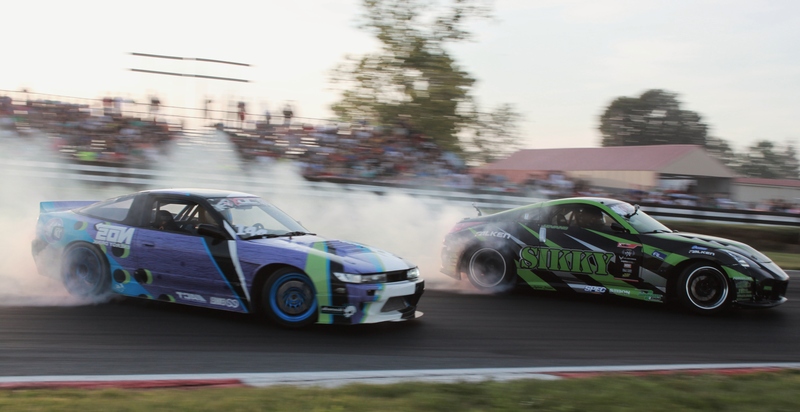 He is the back to back champion of the XDC series and will also compete in a Formula Drift event being held in New Jersey the weekend following Hyperfest. He says he enjoys the downtime that Hyperfest has compared to other events he has competed in this year. When he and the crew aren’t tuning the car, they’re showing off tricks on his bike or skateboard. He and his old friend Cody Slack, who travels around the country documenting DeNofa’s drift events on his camera, share stories about being on the road, like one of them almost falling to his doom from a sleeping spot on the truck. “You should see it,” he laughs. The team share the tale of an old 1988 Ford Diesel truck, which they had to buy on the road on their way back from an event in Arizona after the truck they had for the trailer was t-boned and totaled. Unexpected expenses like this sheds a little light on some of the struggles faced on the road in this sport. 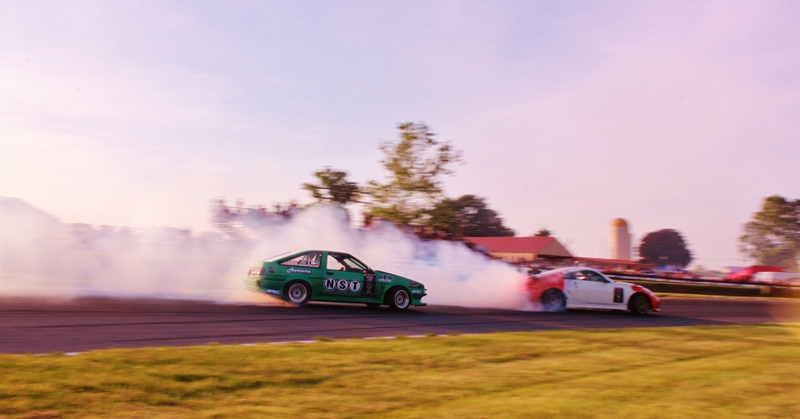 When they’re not racking up costs of traveling on the road, they’re having to budget money for parts, fuel and tires to maintain their drift cars. Most of the drivers are mechanically inclined and able to repair any damages themselves, but when the tread of a tire wears down it loses traction and can cost a run. Sometimes a driver can only have two to three runs before having to change the tires and there are multiple practice, qualifying, and tandem rounds. 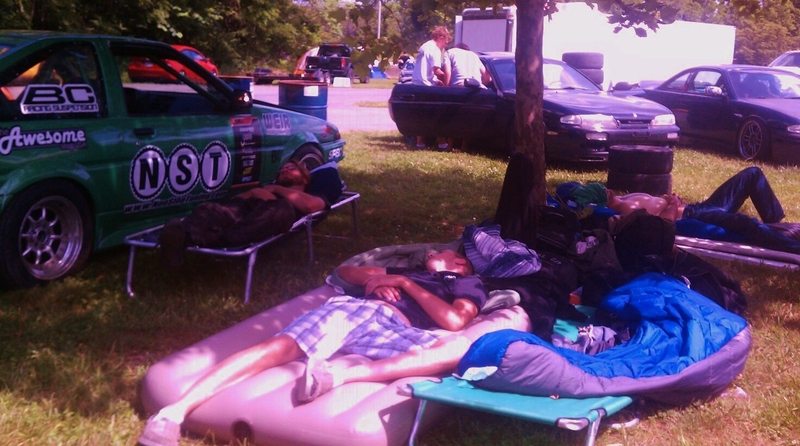 But, this is the lifestyle these drivers, crews and owners live for, so to the team it’s worth every penny. 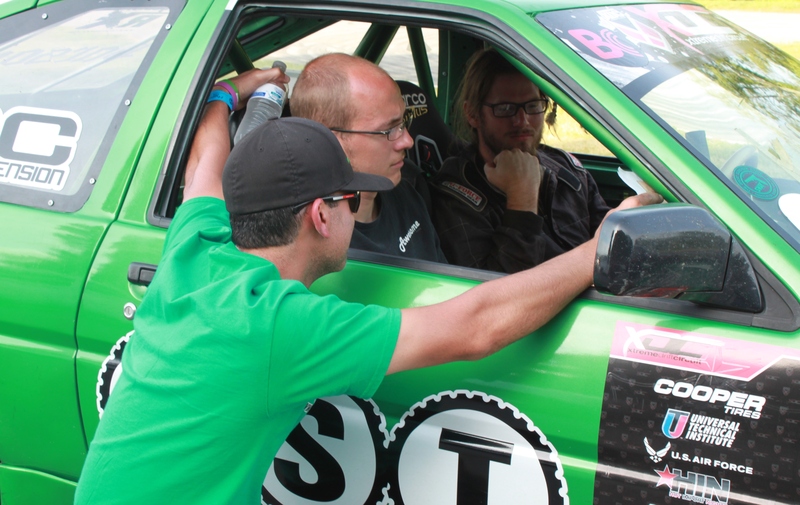 One of the top drivers at the event is overheard discussing his desire to go to more competitions. He too loves this sport, but he is a having a hard time finding sponsors. He’ll have to pass on some of the upcoming events. As one of the more fortunate teams, the NST drivers express their gratitude for the sponsors and the fans who make it possible for them to travel around the nation and compete. Rahimi says the team has come a long way to where they are now. Back in the truck, DeNofa calmly waits for the tandem rounds to begin with one goal in mind: win. Parsons lays outside on a cot, surrounded by other crewmembers catching a short nap under the shade of a tree from the summer sun. 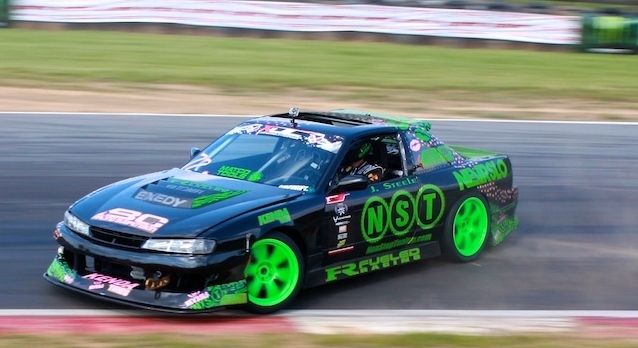 NST’s S13 Nissan 240SX driver, Joshua Steele, competed at Hyperfest the day before and is already on the road back home. He fell just short of the qualifying top 16. The sun begins to set on the stands that are now full of spectators. People line up along a fence while Jared Jrod DeAnda entertains the crowd as the voice of drift. Media and emergency personnel sit isolated on the inside of the track. At one point just before the tandem rounds they assist with a highly intoxicated man, who hysterically claims to have lost his child. Fortunately, officials say the child is safe at home with his mother. The top qualifiers are paired up in a bracket and one by one a driver is knocked out of the competition. Some of the cars that appeared to own the track during practice and qualifying rounds now surprise the crowd with disappointing runs as their cars lose control or their drift. Other’s cars satisfy the crowd’s desires as they loudly rage against their rivals or overcome a clip that previously challenged them. 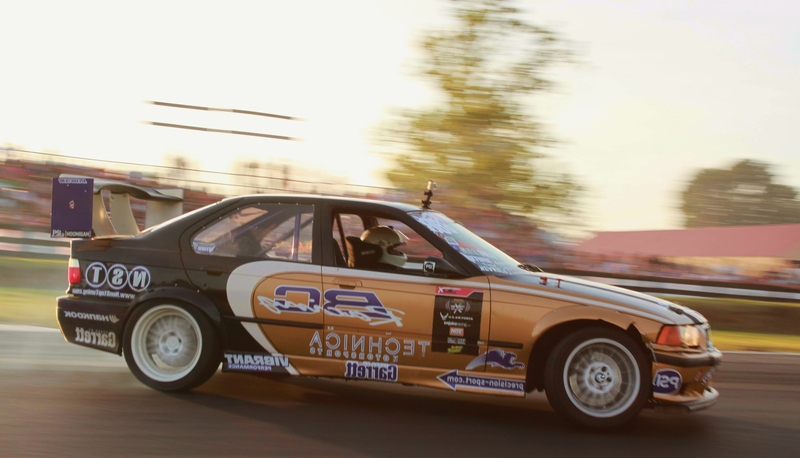 As the number two qualifier, DeNofa ‘s E36 BMW M3 drives into the Tandem rounds like a bat out of hell. 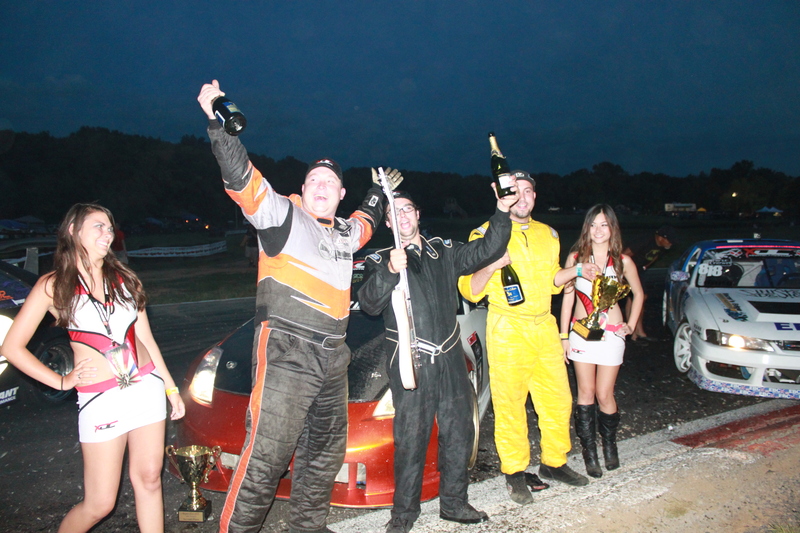 In the first one, he is paired with S13 Nissan 240SX driver Troy Manners and wins. Parsons’ streak of four consecutive top four finishes, dating back to the 2011 season, comes to an end when he is knocked out of the Tandem rounds after a “One More Time” against Matt Waldin. Still in, DeNofa defeats Doug Van Den Brink and Jeff Jones. Hyperfest fans jump to their feet and cheer loudly as DeNofa battles closely against Waldin’s Nissan 350Z for the number one spot. The top three drivers make their way around the track and park in front of the stands. Champagne is popped and the champions joyfully aim and attack each other like children with super-soakers. 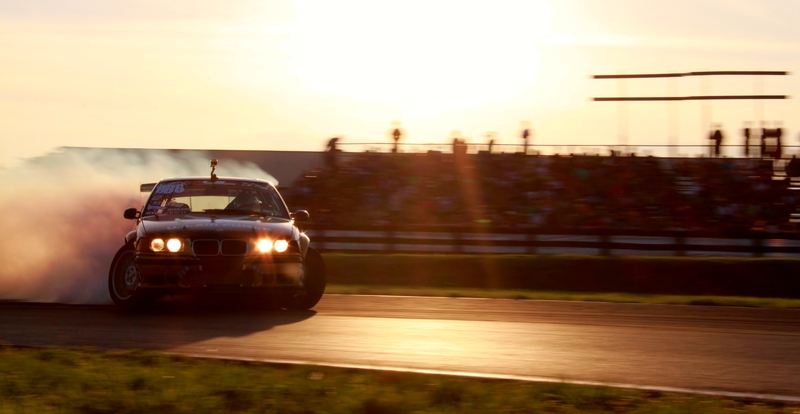 A Canon camera flashes and captures the moment as night falls on the last night of Hyperfest. Everyone walks and drives their separate ways, while many go on to camp and party–the NST team pack and roll away. It’s time to hit the road again. Posted on June 23, 2012, in Guest Blogger, Motorsports, NonStopTuning, NonStopTuning Media and tagged 2012 XDC Summit Point WV Media, 2012 Xtreme Drift Circuit Media, NonStopTuning Drift Team, NST AE86 F20 Turbo, NST AE86 Will Parsons, NST BMW M3 Chelsea DeNofa, NST Joshua Steele LS1 S13, NST Meagan Ellsworth, XDC WV Photo Pics. Bookmark the permalink. 4 Comments. This is fantastic stuff! Long live NST!!! Thank you! The support is MUCH appreciated!! !